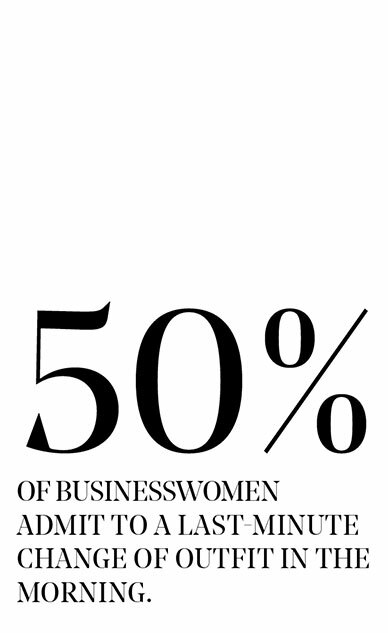 Women are rising up the ranks in business and boardrooms. Almost 28% of board positions in FTSE 100 companies are now occupied by women, up from just 12.5% in 2011, according to the latest Hampton-Alexander Review. 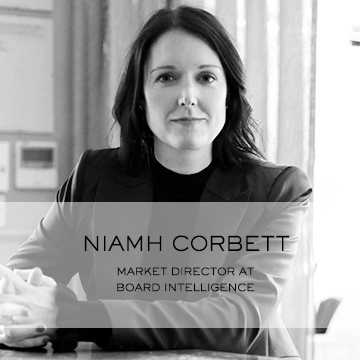 Meanwhile, the number of all-male FTSE 350 company boards has fallen from 152 to just 10. 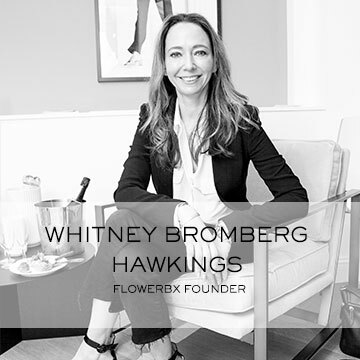 These ambitious, high-flying businesswomen want a sharp, top-quality wardrobe to match their seniority. But fashion brands have been slow to catch on, chasing trends instead of focusing on the customer and her lifestyle. This doesn’t just affect how others perceive you; it can boost your own self-confidence and performance at work. A study on ‘The Cognitive Consequences of Formal Clothing’ in 2015 asked subjects to change into formal or casual clothing before cognitive tests. Wearing formal business attire increased abstract thinking — an important aspect of creativity and long-term strategising. Smart clothes are empowering. If you want to be a big-ideas person at work, dress up. The way you dress can influence your career. 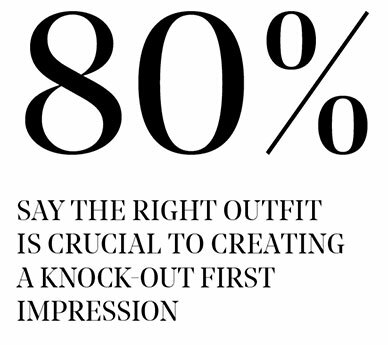 98% of businesswomen believe their personal dressing style helps them achieve certain objectives at work, and nearly 80% say the right outfit is crucial to creating a knock-out first impression in meetings and boosting credibility – especially in environments where women are in the minority. If you don’t care about your appearance, one has to wonder if you care enough to do an A+ job. Your external appearance is often indicative of your internal discipline: if you dress sloppily, people may think you work sloppily.’ We’re all guilty of judging others based on how they dress; 74% of businesswomen admit they assess an individual’s ‘executive presence’ based on their outfit. 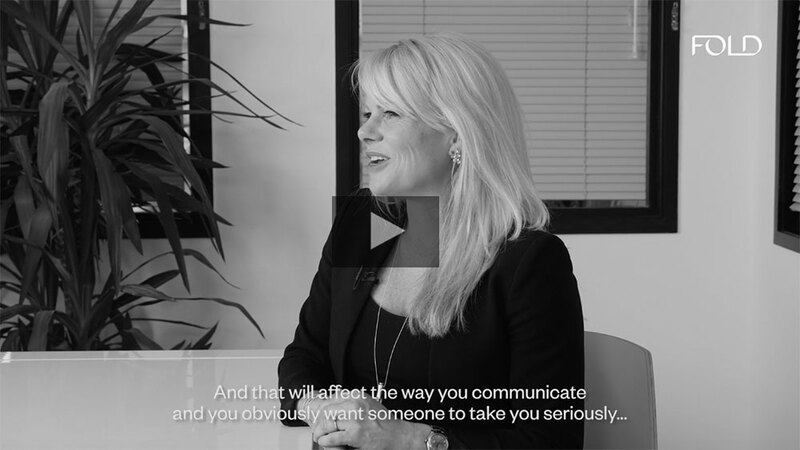 If you don’t look the part, you won’t get asked to represent the company – and that can have a domino effect on pay and promotions. ‘I don’t take poorly dressed junior colleagues to meetings,’ admits one respondent. ‘I’ll reject candidates if their appearance isn’t aligned with the professional impression we need to give our clients,’ says another. And it’s not just other women we judge. Men are subjected to these biases, too: ‘I have a male colleague in his 50s who dresses like a teenager. 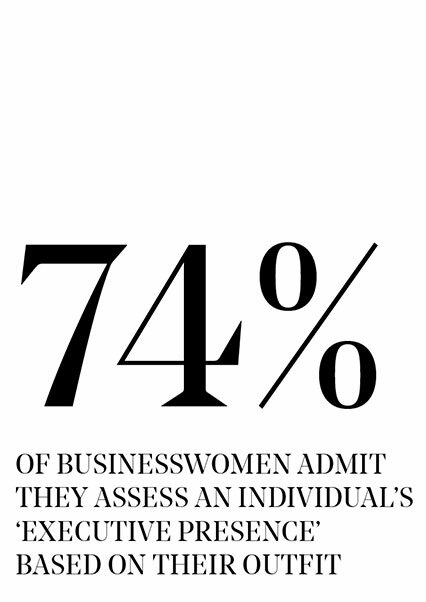 He’s good at his job but I wouldn’t support him for any sort of leadership role.’ These judgements aren’t always silent: 48% of businesswomen say they’ve given direct feedback on a co-worker’s choice of outfit, ranging from constructive criticism to complimentary comments. A further 25% wanted to give feedback but didn’t, leading to sideline conversations behind people’s backs, potential exclusions from key meetings or opportunities. Two simple words on Twitter have highlighted the magnitude of sexual harassment: #MeToo. The hashtag was shared nearly a million times in 48 hours – and women are continuing to speak out. In our survey, two out of three businesswomen admit they’ve been subject to unsolicited, inappropriate comments about their workwear. ‘Leering remarks about a shirt or skirt were all too common when I worked in construction,’ says one businesswoman. ‘I spent many years wearing dull trouser suits as a result.’ Another admits that she too receives ‘unwanted attention from men every time I’m in a dress.’ There are harassment horror-stories galore – from ‘a director at a formal dinner shoved his face in my bust when he was drunk’ to ‘a male colleague asked if I was wearing stockings under my skirt’. Others talk of wolf whistles, improper touching and derogatory nicknames ranging from ‘The Shoes’ to ‘Wall Street Barbie’. It’s happening in every country, at every level and in every industry – but women are increasingly calling it out. We want to know what would you do? "A male colleague asked me if I was wearing stockings under my skirt." "A director at a formal dinner shoved his face in my bust when he was drunk"
"Leering remarks about a shirt or a skirt were all too common when I worked in construction." "I receive unwanted attention from men every time I'm in a dress"
Have you ever spent ages getting ready for work only to look in the mirror, decide your outfit’s not right and start all over again? You’re not alone. 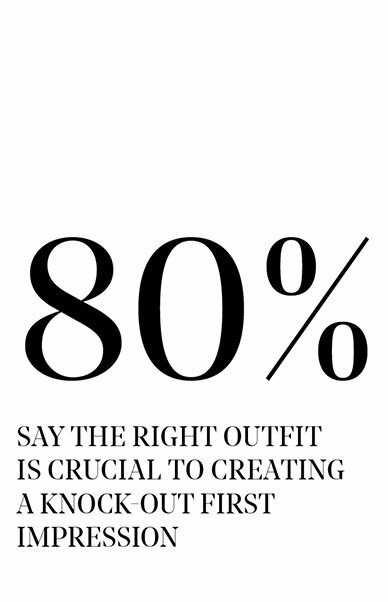 More than 50% of businesswomen admit to a last-minute change of outfit in the morning. 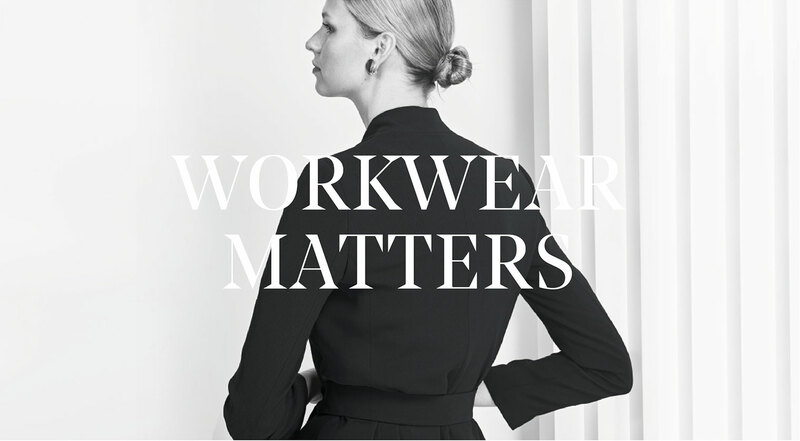 Getting the ‘work look’ right is tough: 40% say they have to ‘carefully consider’ their workwear and one in ten describes dressing for work as a ‘constant struggle’. 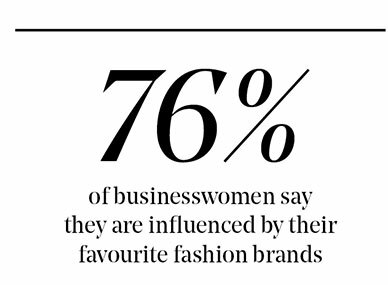 While more than half of senior businesswomen say they opt for ‘business formal’ as their go-to style, younger ‘rising stars’ go for a more casual work wardrobe. The power suit has returned to the fashion fold. We’re not talking stiff shoulder pads and the conservative, pin-striped two-pieces of the 80s executive woman. The modern power suit is a beautiful, top-quality wardrobe investment that’s comfortable, versatile and makes you feel the business. 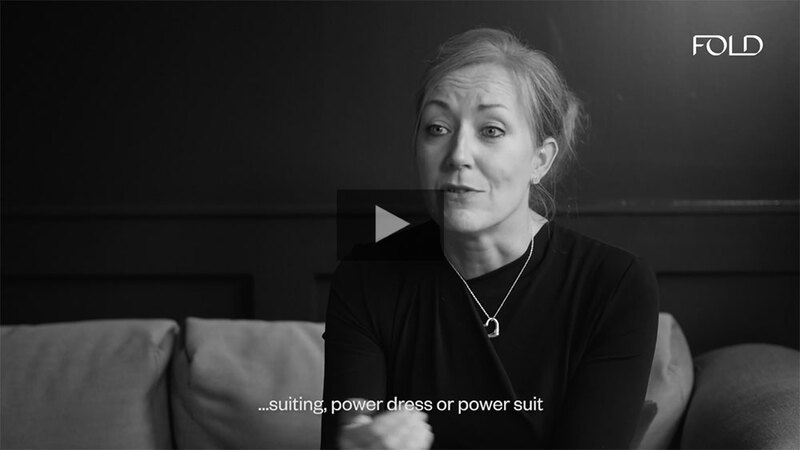 Whether it’s a structured dress and statement necklace, a tailored trouser suit with bold shoes, or a pencil skirt teamed with an eye-catching top, more than 90% of businesswomen say they reach for the proverbial power suit to lift their confidence at work. Mary Barra, the chairman and chief executive of General Motors Company, isn’t a fan of dress codes. When she was the firm’s HR chief, she ditched the company’s 10-page treatise on clothing and replaced it with a simple ‘Dress appropriately’. 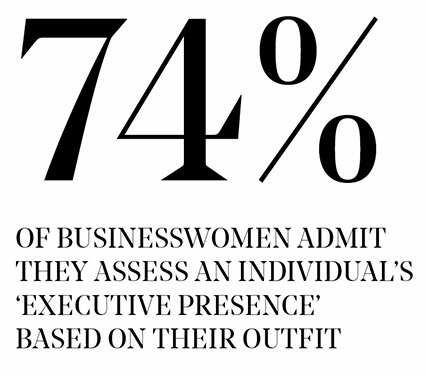 Corporate dress codes are a tricky area: 65% of businesswomen reckon they’re patronising, inappropriate or politically sensitive. ‘We live in a very litigious society, so there’s a feeling of having to tiptoe around this issue,’ comments one businesswoman. 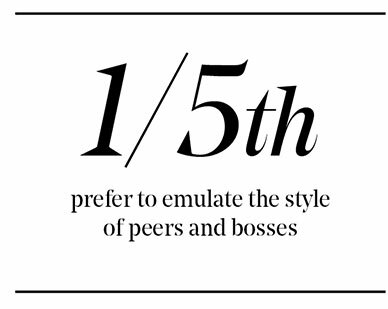 ‘It’s seen as frivolous, when it should be seen as branding.’ However, nearly half say they would welcome some form of ‘corporate guidance’ on what to wear for work, with suggestions ranging from style mentoring to personal presentation workshops. Or take a leaf out of Jacqueline de Rojas’s book: the president of techUK gives every (male and female) member of her team time with an image consultant. 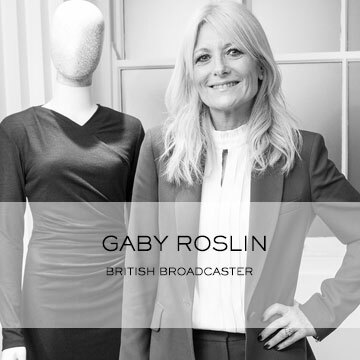 Polly McMaster is keen to see The Fold proactively tackle this workwear grey-area by offering one-to-one styling in store with an emphasis on defining personal brand, ‘It’s about finding a look that you feel comfortable in. For each woman, that will be different – for some a fabulously cut dress, for others, a chic suit or even jeans and a jacket. You need to handle whatever the day throws at you and have the confidence to perform at your best’. What we wear to work matters. So dress for the job you want and own the way you show up to work. Like it or not, you are being judged on your outfit. Don’t let your workwear hold you back from that next pay rise or promotion – and be kind to others. Women still receive inappropriate comments, unwanted attention and harassment over what they wear. But now they’re calling it out. Getting your work wardrobe right is tough. 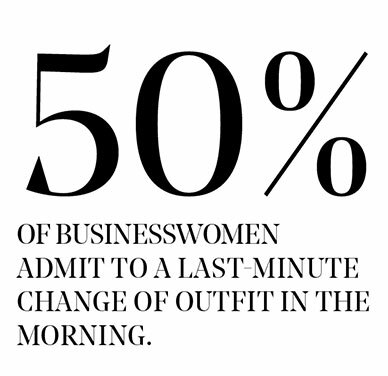 More than half the women we surveyed admitted to a last-minute change of outfit in the morning. 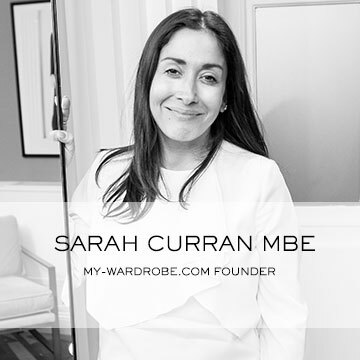 Find out what suits you and invest in a capsule wardrobe to simplify the morning routine. Clothing confidence comes with age and experience but you can shortcut this by taking cues from peers, stylists, celebrities and, of course, your favourite fashion brands. For important meetings or events, many women surveyed reach for their proverbial power suit. This top-quality, ‘wow’ outfit helps them to command respect, project seniority and feel unapologetically powerful. Few working women want a formally-written dress code. But most would welcome a little extra help in the form of corporate style mentoring or personal branding workshops. The Fold would like to thank the following from London Business School for their contribution in compiling this report: Amrita Srivastava, Xing Sun and Mitali Israni.